2009 All-Star Scott Forst Artpiece #3 Red, White & Blue And 80th All-Star Banner - Unautographed. 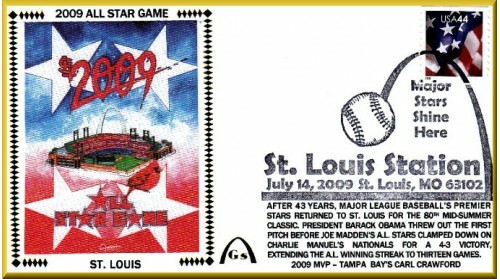 St. Louis - 2009 All-Star Game - Postmarked July 14, 2009, St. Louis – 80th All-Star Game - # 6 Envelopes. Nine Different Designs Includes 3 Scott Forst Artpieces, (#1- Pink Background With Gateway Arch, #2 - Red Background With Star And 80th All-Star Banner, And #3 - Red, White And Blue Star With Busch Stadium). There Were 6 Game Photos, 3 American League Players (Roy Halladay, Joe Mauer And Carl Crawford), And 3 National League Players (Yadier Molina, David Wright And Tim Lincecum). All Artpiece Envelopes Are Printed With The Same Game Information. The National League & American League Envelopes Each Reflect The Starting Lineups. Autographs Available On National League: $100—Yadier Molina: Autographs Available On American League: $100--Carl Carwford: $90--Joe Mauer: Autographs Available On Scott Forst Artpieces: $60--Charlie Manuel, Or Adrian Gonzalez,: $50-- Jose Altuve. Or Torii Hunter: $10--All Unautographd Envelopes. We Created 150 Of Each American League And National League And 180 Artpiece Envelopes To Where Both Gateway And The Customer Can Acquire More Autographs. #6-Sized Envelope Unautographed.